Did you know automating your warehouse operations can result in huge savings? The manufacturing warehouse represents a gold mine of potential savings from automation and a Warehouse Management System (WMS). Where do these savings come from? 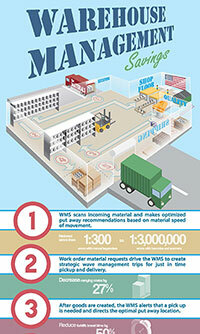 Download this infographic for a quick view of just how much you could save and where with a Warehouse Management System.